Vintage Style Advertising Posters, etc. Knox's Spice Co. Posters etc. In the spirit of poster art we have decided to create vintage and period posters. 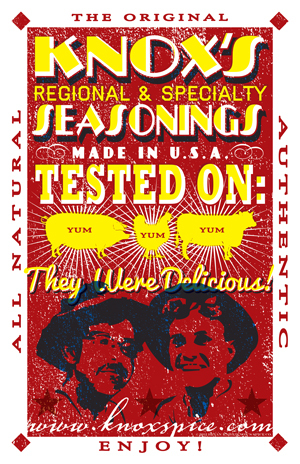 Originally created for stores that carry our seasonings, now available to anybody who would like one. Great gift for anybody looking for kitchen art. Our first is a tribute to Tim Knox and his strange sense of humor. He would tell people "Our rubs are tested on pigs, chicken and cows. They were delicious". His love for traditional value led us to create this poster in the style of vintage wood block printing and inspired by the Hatch Poster Shop in Tennessee. Designed to look like block printing as it would have been 100 years ago or so. Brighten up your walls with our vintage style print. Fits in a standard 11" x 17" poster frame. Ships in a heavy duty mailing tube. 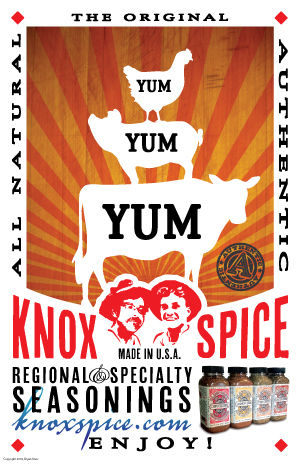 Knox's Spice Co. "YUM" poster. Started out as a 1950's style poster fashioned after boxing or early music posters. Seems we could not make up our minds but feel it fits into the collection. Fits in a standard 11" x 17" poster frame. Ships in a heavy duty mailing tube. Knox's Spice Co. "YUMMY CHICKEN" poster. 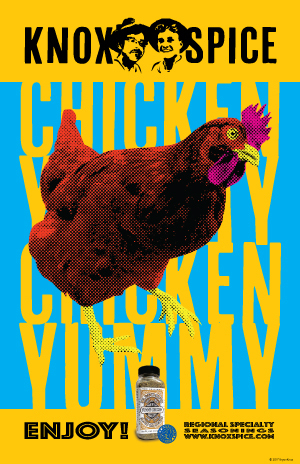 We wanted to single out our Yummy Chicken dry rub with its own poster as it is just that good, and we love chickens. The original concept for this poster was to portray an Andy Warhol style. Not sure we nailed it but everybody seemed to like the big chicken. 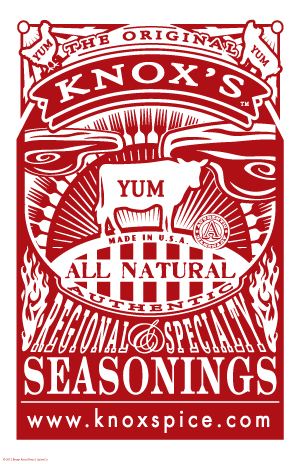 Knox's Spice Co. "Sold Here" poster. Featuring our original 3 dry rub spice seasonings in the now discontinued vintage jars. We think it is just good marketing and we love posters so there you have it. Styled after turn of the century advertisements. Great gift for collectors and enthusiast of culinary arts, BBQ or period marketing. The bright orange and red pop especially in a standard black poster frame. Brighten up your kitchen or the kitchen of someone you love. A unique house warming gift or artwork for your kitchen. 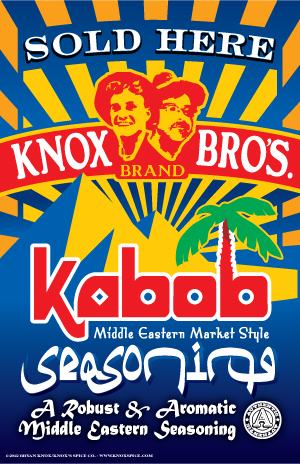 Knox's Spice Co. "Kabob Sold Here" poster. 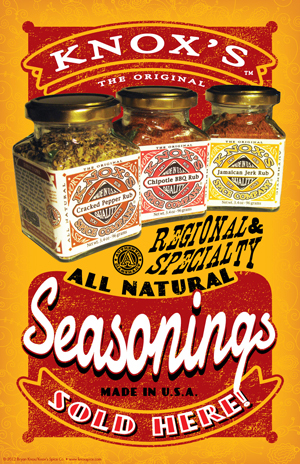 Featuring the art of our Kabob Middle Eastern Market Style seasoning label. Created as a retail advertisement but a nice addition to brighten up a kitchen or as a unique house warming gift. Fits in a standard 11x17 poster frame. This poster was originally designed as a T-shirt in 2012. The poster shows a cow on a grill grate hilltop with a fork sunrise and steak clouds. We wanted to create one for chickens, pigs and fish respectively but things do not always work out the way you want them. Maybe some day the others will get finished, just like the T-shirts. This poster is a statement for the love of grilling and BBQ and is a unique addition any kitchen. Cooking With Alcohol is not necessarily for cooking using alcohol as an ingredient. Knox's Spice Co. cofounder Bryan Knox compiled this cookbook in 2004 from recipes that had been collected as 'go-to' recipes when cooking with friends and family. It has little to do with the Knox's Spice Co. although there are several dry rub and marinade recipes in it. Printed in soft cover as a gift for friends and family in 2006 and made available to the public that same year. 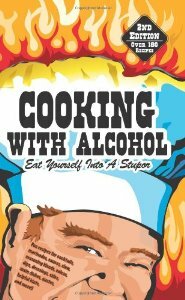 Cooking With Alcohol contains recipes for cocktails, marinades, rubs, sauces, dips, salad dressings, salsa, cole slaws (yes, several), side dishes and main dishes as well as jokes, culinary quotes and more.